Chocolate pots de creme espresso creme! 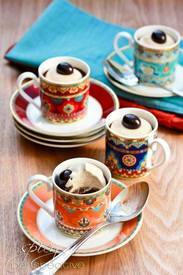 These Chocolate Pots de Creme with Espresso Creme topping, are not only a salute to the artistry of the cups they are served in, they are a celebration of rich dark flavors. The kind of flavors that bring you to a stand still, then have you coming back for more.